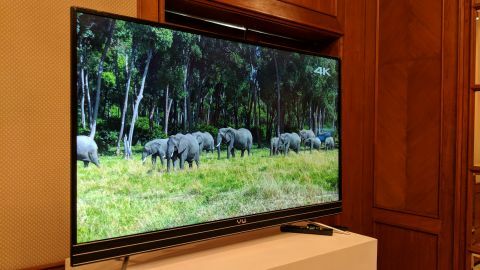 Vu with its 55-inch 4K panel, full-fledged Android TV features and a plethora of connectivity ports is a bang for buck option. It's just the missing HDR support and sloppy upscaling that restricts it from being the best in its price range. Before Xiaomi shook things up with its Mi Smart LED TV range, the smart TV space in India had become quite dry. The problem? Consumers were stuck on its highly competitive price, completely blindsided by the fact that it is just another smart TV offering with a custom Android OS. Apart from great picture and sound quality, a smart TV should deliver functionality and features that make it more than just a large display that shows content. Just adding internet connectivity, apps and a browser doesn’t cut it. In our opinion Android TV is a pretty grounded OS for smart TVs, sadly, the only known options in India come from Sony, TCL and now Vu. When Vu launched its ActiVoice enabled Android TV range in India, I wasn't very eager to see another set of 4K TV arriving with an affordable price tag. But things changed when it arrived at my place and I turned it on. No matter how much you spend on a product, the first thing that you notice is the design. In this case, I received the 55-inch variant, which obviously is huge and takes a lot of space if you plan to rest on a table. On first glance, they definitely look premium, even if the built-in sound-bar seems dated and the plastic isn't of the best quality. Neither I expected it to be as good as the ones on Sony, LG and Samsung's. The panel has only a thin frame around it with no bezels, which is nice to see. The only thing that we didn’t like was the coarse plastic finish of the back panel, which more or less stays hidden. The build is quite solid and it weighs closer to 15Kgs with stands, making it hard to tip over. Furthermore, it’s very easy to assemble using both the wall mount and stands. Also, if you are into super thin TVs, this one won’t impress, because of it being marginally thick. This is where the Mi TV takes the lead as it looks super-slim and stunning. Apart from that, the stand feels firm and all the ports are well placed and easily accessible. Speaking of which, you get two USB ports (USB 3.0 and 2.0), three HDMI ports with ARC support, optical audio out, a 3.5mm headphone jack, an ethernet port and standard RCA ports. Other connectivity options include Bluetooth and dual band Wi-Fi (2.4GHz and 5GHz). If compared to other 4K LED TVs at this price, the finish and quality of material is still better than most. The TV runs on Android TV 7.0 Nougat, and it offers an easy to use and smooth user experience. Unlike many smart TVs, it has the Google Play store to allow downloads for applications and even side-load international apps. Thankfully, the TV is void of unnecessary bloatware, but it still packs some local streaming apps like Hotstar and Alt Balaji right from the boot. Additionally, you get a set of video streaming apps like Youtube and Netflix. What I like the most in this TV is the built-in Chromecast. It allows you to mirror your phone’s screen and cast content on the TV without needing an additional application. But you might need to install additional apps (like VLC) to watch some of the 4K videos as it struggles to support DTS audio in its resident video player app. Vu bundles two remotes with the TV, where one is to access the basic TV functions and navigate through menu and the other is a Bluetooth remote (you don’t need to point it towards the TV to work), which houses the voice buttons, navigation keys, a toggle for volume and mic button for voice inputs. You can simply press the mic button to say a command to the assistant and it works quite well. Although, handling two remotes at once is difficult, but while I was using the TV, I realised that the primary remote isn’t necessarily required all the time. The voice remote does almost everything that’s needed to discover and navigate through content. The only thing that didn’t go down well is the missing support for HDR in 2018. Also, having a pointer to hover over the interface would have made it a lot easier to operate. The display has a matte finish and the company has used an A+ grade IPS panel. All three models get the same 4K resolution (3840x2160) and the quality felt good for the first few minutes. We tried watching some videos and of course play around with the Android TV interface. If the content is of 4K resolution, then this TV will not give you much to complain about when it comes to picture quality. Things are a little different with the 1080p content, as it isn’t very efficient at upscaling video with lower resolution. But as I said, UHD content was very well reproduced in most cases. Unlike most affordable TVs, there’s no light leakage even while looking at it in the dark. The panel quality is impressive for high resolution content. But the image processing isn’t up to the standards of Samsung or Sony televisions, as picture isn’t enhanced artificially. The panel at 450 nits is decently bright and the colour reproduction is impressive too. However, we weren't fully impressed with the quality as the blacks didn’t feel deep enough and colours could have been more punchy. Unfortunately, I didn’t get a chance to connect it to a gaming console. So, I can’t really say if it’s worth buying for gaming or not. The sound-bar at the bottom features a two box-speaker system rated at 10W each. The company says that it supports Dolby audio as well as DTS TruSurround. The audio is flat, but definitely loud and it does fill up a large hall easily. There’s no denying the fact that the 55-inch Vu 4K TV offers good value for money. Since the price for the 55-inch Mi TV 4 is increased by around 5K, the value for money proposition of the Vu 55SU138 4K UHD Android TV has jumped up by a margin. Also, Mi TV is quite hard to get through flash sales, giving you another reason to consider this option. While the design on the Mi TV 4 is way better than this, there are a few add ons like voice control and Play Store that make up for what the design lacks. The display panel is impressive enough to play the 4K content, but it’s just the missing HDR support that hurts the overall composition.